Stay Safe this Halloween with SafetyTat! SafetyTat was created by Michele and Bob Walsh and is a great tool for helping parents of small children keep their little ones safe when out in public. Safety Tat is a temporary tattoo which can be pre-printed, or written on, with any information you choose including phone number, health information, etc, in case a child get lost. 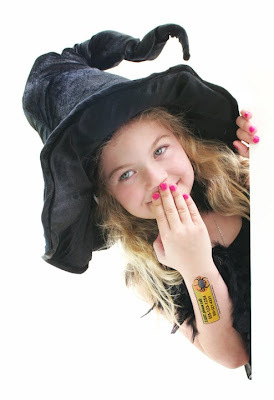 Just in time for Halloween SafetyTat launched a line of Halloween Tats, with designs that include pumpkins, pirates and a haunted house. The Halloween Tats also feature a tat for allergies! SafetyTat has dozens of adorable designs that are sure to please any child! You can even design your own on their site if you can’t find one you like. How fun is that? From now until November 8th all Multiples and More readers can get 10% off any $15 or more purchase at SafetyTat! Simply enter the code: MultiplesandMore at checkout. The code is case sensitive. What are you doing to stay safe this Halloween?